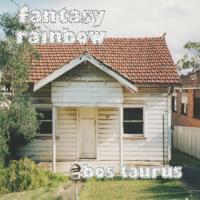 RockUnitedReviews: FANTASY RAINBOW: "Bos Taurus"
19 year old Indie Rock kid from Manchester records debut album in Nashville?? Bloody'ell, it's like reading one of those awful headlines by The Sun. Completely unbelivable and utterly false? But no, the pale slacker kid brought up on deep fried mars-bars, bangers and mash, chips, and pudding, gets invited to record in Nashville, Tennessee, US of A, in Sputnik Sound Studios run by Grammy Award winning producer, Vance Powell (Jack White etc). North East U.K. footie gone country U.S. soccer? Well, Fantasy Rainbow (dodgy monicker?) is in fact the project of Oliver Catt, and no, we don't know if he's sporting a blue or red jersey. Last year, however, the eighteen year old, recorded four songs with the help of friend Coddington, a collaboration which led to a demo which would generate a large amount of buzz in the north east music scene. Over the next nine months Fantasy Rainbow would go on to release three releases in the shape of the 'Teens' EP, the 'No Hope. Not Ever' EP and the 'Healthy Lung, Dirty Lung' cassette. Really? the old cassette? Yeah, simply get in touch with the Catt and he'll soon hook you up with the old skool tape and he'll hand draw the cover too?! Just in case anyone was wondering, it's hardly the Oasis or Joy Division based material. However, to really simplify things, there are fragments and tiny bits and pieces of the mellow work of Beck, Daniel Johnston, and old skool George Harrison (the hare khrisna days/daze). Anti-social, perhaps even off-beat? The point of calling your debut album something like 'Bos Taurus' is clearly to project the listener with an image of alternative music and experimental ideas? Signed to Heist Or Hit Records and with a bag of quirky fun tracks (Soda Scream, Condominium, Ear Wax, Porta, O Weirdo, Golf World, etc), Fantasy Rainbow deliver a charming debut with strong material and dodgy monicker. T&N: "Slave To The Empire"
ANDRE MATOS: "The Turn Of The Lights"
Jimi JAMISON: "Never Too Late"
MANOWAR: "The Lord Of Steel"
ODIUM: "Burning The Bridges To Nowhere"
NIGHT RANGER: "24 Strings And A Drummer"
GEOFF TATE: "Kings & Thieves"
ELO: "Mr. Blue Sky The Very Best Of"
BOY HITS CAR: "Stealing Fire"
MARK SPIRO: "Care Of My Soul Vol 2"
MARK SPIRO: "Care Of My Soul Vol 1"